Life is easy if we want to live on the surface—enjoying all the pleasures that money can buy, indulging our whims and fancies, including a few addictions. But the issue is this: Can that make us happy? Who is a truly happy man? Rev. 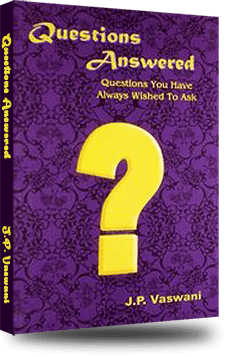 Dada J.P. Vaswani answers this tough question for us: He who desires nothing, claims nothing, expects nothing, and is free from hatred and fear. He, who opens his heart to reach out, to love and care for people, and all creation around him. This book gives an insight into how we may conquer the mirage of superficial pleasure and attain true happiness. Each chapter teaches you how to deal with every kind of negativity lodged in us—through simple anecdotes, stories, and valuable tips. This enriching compilation from the work of a world-renowned spiritual leader of India, Dada J.P. Vaswani, the scientist turned philosopher, whose key resource to transform the hearts of people is: Simply Love! So, whether you are out to overcome anger, hatred, desire, greed, jealousy, fear, or depression—or looking for inner peace, faith, hope, and the true joy of living, his profound insights to help us through this book. Dada expresses himself with so much love and warmth that the reader is gently inspired to grasp the essence of his wisdom and turn over a new leaf. Dada touches on aspects from A to Z, discussing each vital issue with his amazing perception and understanding. He uses wit, humour, anecdotes, experiences, and stories to empower the reader to become a better human being. Read on for one hundred aspects of Dada’s teachings. 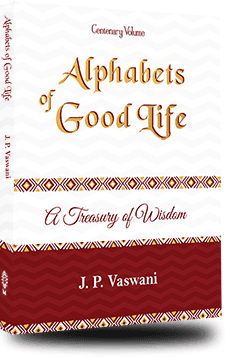 J.P. Vaswani is a spiritual luminary, a practical philosopher, and a touchstone of positive change for thousands around the globe. A scientist by training, a visionary by nature, and a Life-guard Guru by example. “Dada,” as he is affectionately called, delights audiences with is incisive wit and delightful repartee. Dada carries the flame of love, tolerance, and compassion worldwide through is passion and powerful oratory. What a triumphant last book after a century of service. 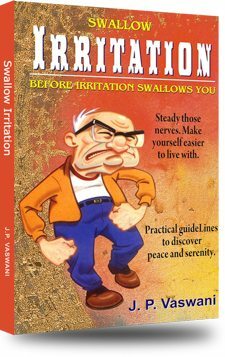 Swallow Irritation Before Irritation Swallows You Free!